A constant barrage of geopolitical tensions coupled with the forceful rhetoric of President Trump has sent defense stocks and exchange-traded funds (ETFs), such as the iShares U.S. Aerospace and Defense ETF (ITA), soaring. 4) The passing of a $700 billion defense bill by the Senate for war spending and the production of 94 F-35 Lightning II jets. As the premier defense and aerospace ETF, ITA has daily fund flows in excess of $3 million and is in a position to take advantage of favorable developments in the defense sector, such as those mentioned above. 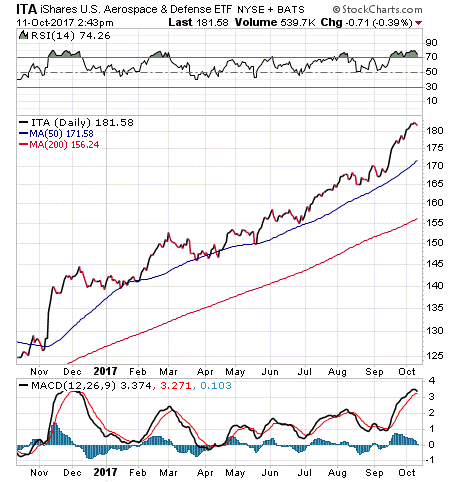 Of the several major ETFs covering the defense and aerospace sector, ITA probably has the most straightforward investment strategy, as it diversifies by capping the weightings of the biggest securities. In terms of performance, ITA has amassed an enviable year-to-date return of close to 30%, making it not only the biggest defense ETF in terms of assets at $4.3 billion under management, but also among the strongest performers this year. The fund’s 0.44% expense ratio is not the cheapest in the sector, but also not the most expensive. ITA also offers a small 1.1% yield. ITA invests most of its assets in pure-play defense and aerospace companies. Plus, 57% of the fund’s assets are invested in the top 10 holdings, and many big-name defense and aerospace contractors are on that list. Boeing (BA) has the biggest allocation at 10.20% of the fund’s assets, followed by United Technologies (UTX), 7.92%; Lockheed Martin (LMT), 7.43%; General Dynamics (GDI), 6.54%; and Raytheon (RTN), 6.16%. The fund is non-diversified. Investors who anticipate that global turmoil and President Trump’s agenda will continue to boost defense stocks in the near future could find the iShares U.S. Aerospace and Defense ETF (ITA) a worthwhile choice. Global investing expert NIcholas Vardy discusses how this value play on Florida real estate has attracted the attention of a well-known guru.